Jargon watch! When I talk about a "social discovery" site I'm talking about the likes of Digg and Reddit (the old school) as well as sites like Tweetmeme (the new boys). I'm a great fan of Tweetmeme, whom I follow on Twitter, because the (free) service helps me notice content I would otherwise not have found. Here's a chain of screen grabs from this morning. First off Tweetmeme brings me some interesting gaming news. 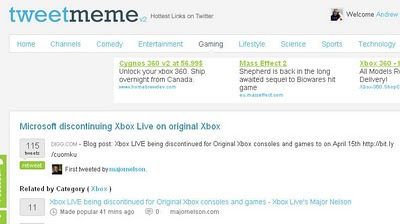 No more Xbox Live for original Xbox users. Ouch. Poor things. Tweetmeme lets me see that it was Major Nelson himself who started the discovery thread. I click... and wind up on Tweetmeme. Tweetmeme needs to make money. They point these links at their site where they'll surface other content for me but also show me an add or too. So, I need to click again. Oh! Great! Another summary of the news. Now I'm at Digg.com. You can see how pointless this is. 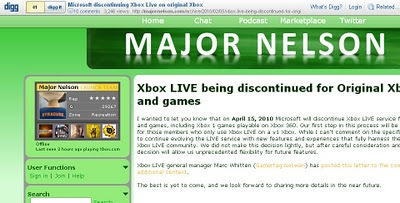 If this was a perfect world, where no one needed to make money, the Tweetmeme link that appeared in my (free to use) Seesmic Desktop would have taken me straight to the blog post about Microsoft dropping Xbox Live support on the original Xbox. It's worth noting now that if you go back to Twitter and click on Major Nelson's tweet you don't end up at Digg. You end up in a Digg framed blog post. All the sites and services I've mentioned so far are free. The service I'd be happy to pay for is Seesmic Desktop (if you run multiple accounts it crushes Tweetdeck into the ground). Here's a paid-for service that Seesmic could offer and which I'd pay for - take me straight to the surfaced content. Seesmic could, for example, extract the URLs from Digg and Tweetmeme.com page so the "offending" link could be updated in the desktop client. Clicking on a link to tweetmeme.com in Seesmic Desktop (or a rival) could bypass Tweetmeme.com and take me to the original link. I do this already for some sites with Yahoo Pipes. It's easy enough to grapple with the HTML, extract the URL you want from the page and then modify their RSS feed by swapping in the "original" sites. However, this does break when the site updates its HTML and I fail to find the time to update the Pipes code. In short - Twitter and social media clients could threaten discovery sites simply by offering users a way to bypass them.